His flint-like attitude and committed tackling earned him the nickname of the 'Anfield Iron' and spawned a thousand stories - many apocryphal - of his rugged approach to the game. "Tommy was never a boy - he was born a man!" said an admiring Bill Shankly. Smith's fearsome reputation, however, threatened to disguise his skill and subtle touches, in defence or midfield, which brought him England recognition. 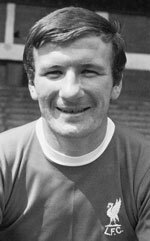 Born a mile or so from Anfield he joined the club ground staff as a 15 year-old in 1960 and went on to become the first Liverpool captain to lift a European trophy when Shankly's side won the League and UEFA Cup double in 1973. His first big impact came in November 1964 when he went out as an extra defender in the No 10 shirt to face Anderlecht in the European Cup, the first time the team had worn all-red. The Belgians were baffled by Smith's role and fell to a 3-0 defeat. His greatest moment came in the final of the same competition 13 years later. On his 600th Liverpool appearance he headed the second goal against Borussia Moenchengladbach in Rome to inspire a 3-1 victory of the club's first European Cup triumph. "I've changed my name to Roy of the Rovers", quipped Smith, who was made an MBE, joined Swansea in 1978 and later spent a year as Liverpool youth coach. The statistics of matches and goals at the top is included in the table by the conducted player of a reserve in a seasons 1969-70, 1972-73, 1973-74, 1974-75, 1975-76, 1976-77, 1977-78. Tommy Smith, Ian Csllaghan and Phil Neal with European Cup 25 May 1977 in Rome.